We all have bad weeks, right? This week I was not at the top of my game. It took a long time for me to adjust to Daylight Savings, mornings with the kids were rough and I couldn’t seem to remember to buy the stuff I needed at the grocery store — even when it was written right there on my list! I forgot to buy milk. Milk! I shouldn’t even have to write that on my list, yet I did and I still forgot it! Criminy! I couldn’t wake up on Monday and we were super rushed, so I made Wyatt eat lunch at school. Tuesday we were out of almost everything and I knew Wyatt wouldn’t eat the stuff I did have so I made him eat school lunch again. 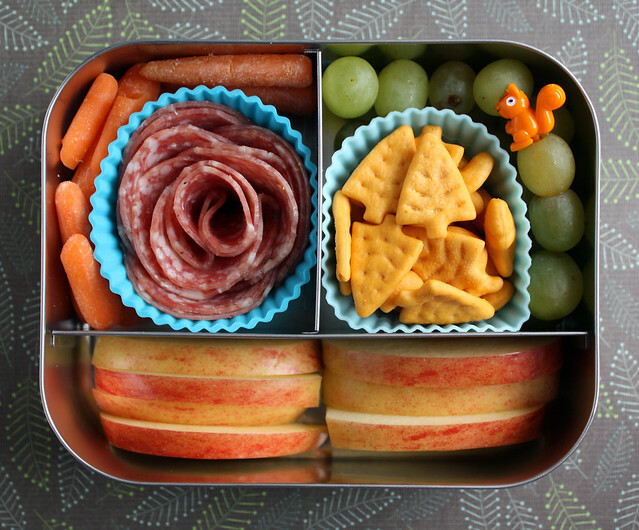 I packed a lunch for Augie, but completely forgot to photograph it! He had a half peanut butter and jelly sandwich, the last mandarin orange, red pepper strips and celery with peanut butter for dipping. 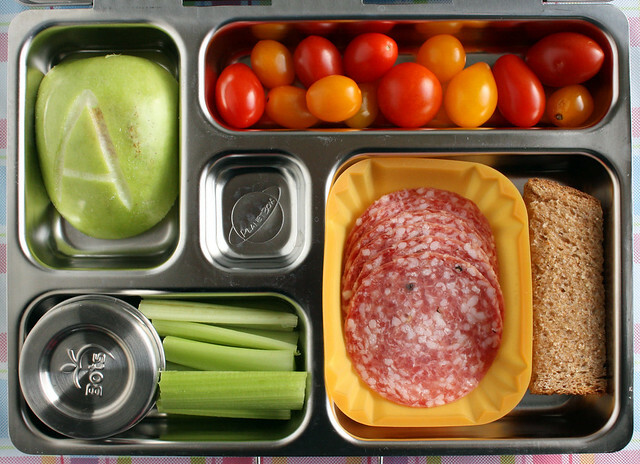 On Tuesday, I packed Augie’s lunch in the PlanetBox : a chunk of apple with an “A” carved into it, grape tomatoes, a couple strips of garlic toast, salami and celery sticks with peanut butter for dipping. 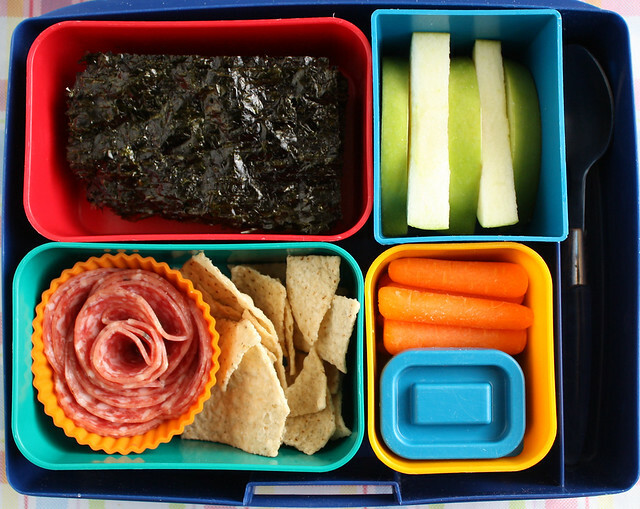 Wyatt’s lunch had seaweed strips, apple slices, carrots and bean dip, tortilla chips and salami. 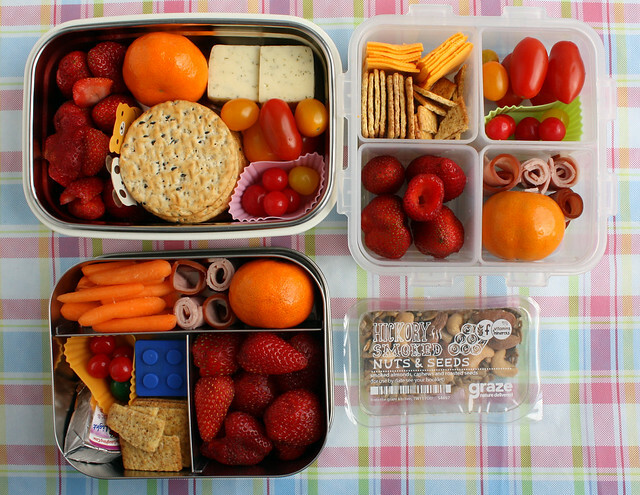 This was packed in a Laptop Lunches bento box. 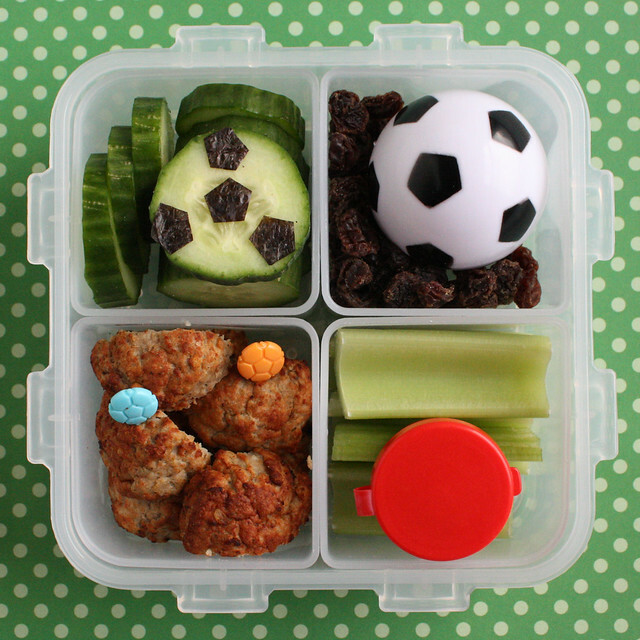 This morning I decided to be a little fancy with Augie’s lunch and this is what happened: soccer lunch! I found a package of little soccer ball containers at the grocery store in the Easter section. This is a GREAT time of year to get small decorative containers for cheap. Target, dollar stores and most grocery stores have plastic containers that are meant to be used for egg hunts and they are all food-safe and fairly inexpensive. I’ve found sports ones (obviously), Star Wars, and Batman and I’m sure there are also girly ones that I’m ignoring because my kids wouldn’t like them. So since I had this ball, I built a lunch around it in the 4-up Lock and Lock box. 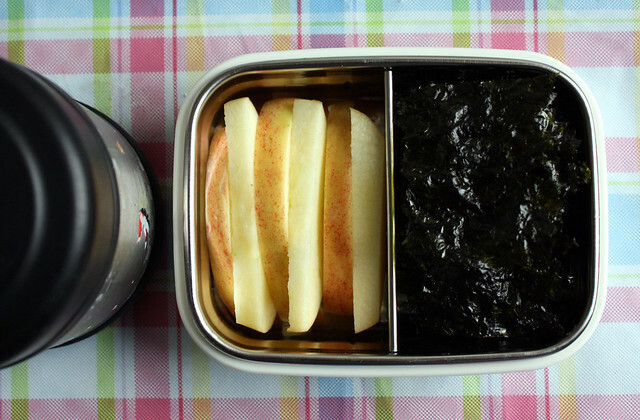 I started with cucumber slices and I decorated one of them with nori pentagons in an attempt to make it look soccer ball-ish. It didn’t turn out as well as I’d hoped, but it was good enough that my 4yo bought it. Next I had raisin “dirt” and the soccer ball container which I filled with goldfish crackers. Then I added celery sticks with a small container of peanut butter for dipping. And finally I speared some meatball chunks onto soccer ball picks. Wyatt had a school field trip today and he started pounding on my bedroom door immediately after my alarm went off asking me to get started on his lunch so he wouldn’t be late for school. For the record, this kid has never been late to school ever — and certainly not because I didn’t make his lunch fast enough! I’m going to chalk it up to youthful enthusiasm and move along. 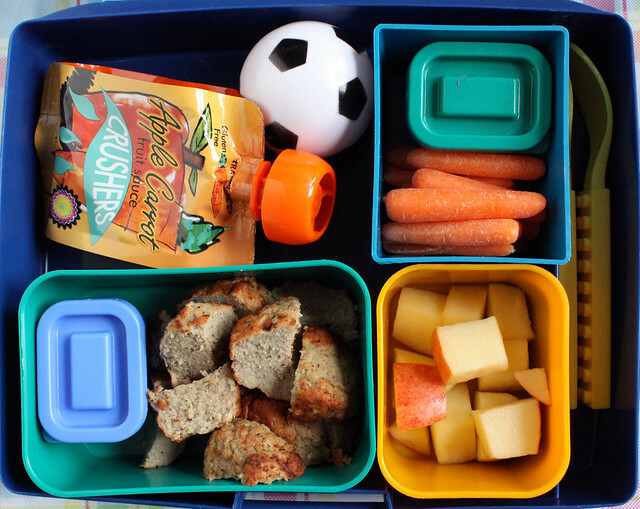 I packed him an apple-carrot crusher, a soccer ball with goldfish, carrots and bean dip, apple chunks (liberally doused with Fruit Fresh to keep them from browning), meatballs and another small container with ketchup for dipping.